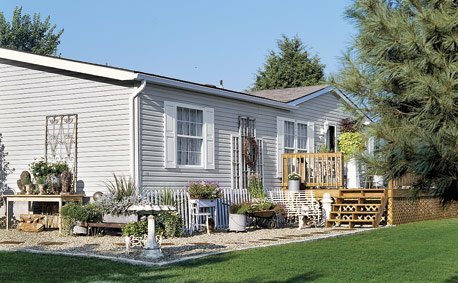 What really got me thinking hard about living beautifully in a trailer was this wonderful feature in a back issue of Country Living magazine. When I saw how an antiques dealer had transformed her double-wide by painting the interiors white and bringing in lots of salvage items to liven up the rooms, I knew it could be done. Now, my tastes don’t really run to rusty painted iron or all-white rooms, but I saw that it was really possible to think outside the box when it came to making things pretty in a mobile home–vinyl walls and all! While this image doesn’t showcase my favorite furniture style, it does show how effective a light color scheme can be, making the room both relaxing and cheerful. The photo is from Better Homes and Gardens, which has thousands of ideas and how-tos for any number of projects. But before I could get started with painting, I had to wash down all the vinyl wallcoverings. Some sites recommended using ammonia mixed with water, but I didn’t want to deal with the fumes. I kept reading around and found that plain, ordinary Dawn dish detergent would do the job. A nice, warm, sudsy bucket of Dawn would cut any grease and leave the walls prepped and ready for primer. I did toy briefly with the idea of removing all the batten strips between the sheetrock panels to create a totally smooth wall. It can be done with spackling tape, DAP’s DryDex, fine sandpaper, and lots of elbow grease. But that was just far more work than I was willing to put into a trailer! So, after washing down the walls and letting them dry, I laid down my dropcloths and prepared to prime the entire living room at once–trim and all, since everything needed primer. While we were at it, my husband painted over the popcorn ceiling (which was looking a little brown from years of catching dirt) after we ran the dust mop over it. He used the largest, fluffiest paint roller available (meant for rough surfaces). Just so you know: ceiling popcorn can come off if it gets damp (this is how it is removed, in fact), so two passes with the roller were all he gave each section. Worked like a charm, and the ceiling is now bright white and beautiful. I didn’t manage to get any photos of these steps, so next time I’ll talk about refacing the kitchen cabinets and show the results!